Here is a peek at how our Product Definition module works. We hope you find this information useful. Product Definition allows creation and maintenance of bills of material, work centers, and manufacturing routings. Estimated or standard product costs may be automatically calculated from this information. Product Definition costing data is used by the rest of the system to perform tasks such as scheduling, costing, and materials and capacity planning functions. With PBS manufacturing software for small businesses, we use the item master database to start to define how we make our products. This is accomplished through the creation of Product Structures (Bills of Material), Work Centers, and Routings. These will define the material we use to make something, the labor operations necessary to actually manufacture the product, and the work centers these functions are performed in. All of this information will be used to develop product costs using the cost roll-up features of P/D. Additionally, this information will be used by other areas of the system to perform automated functions like material requirements planning (MRP), production scheduling, job costing, and capacity requirements planning. The Inventory Management and Product Definition modules are really for the foundation of the rest of the manufacturing system. Now, let’s assume you enter a Shop Order to manufacture an item A. When we perform the multiple-level explosion, the program will automatically generate allocations for Item B, Item C, then it will check inventory for item D to see if there’s sufficient available quantity on-hand to meet the requirement. If there is, the program will simply allocate the quantity required to complete the number of item A’s we ordered. 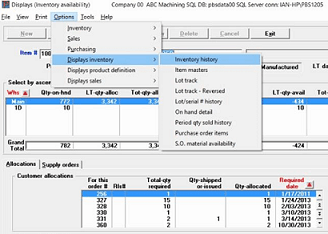 If not, the program will create the allocation, then it will proceed to create a new Shop Order for Item D. Next it will begin allocating the components under item D to this new shop order. This process will continue until the program has gone through the entire product structure. You can see where a make to order manufacturer might find this to be a very useful feature. For each level of production, there will be a product routing. A routing is a document that defines the steps necessary to manufacture an item and the time it takes to perform each step. These steps, or routing operations, will tie back to a work center, which will allow us to build product costs and will also allow us to schedule production against the work centers on the shop floor. This information can then be used to actually impose load, or book time, against our work centers. Doing so will allow you to get capacity load reporting or to do detail capacity requirements planning later. It will also allow you to generate detailed shop floor schedules and then report labor against those scheduled operations. This will be discussed in greater detail when we cover the Shop Floor Control module, which is another module in PBS Manufacturing software for small businesses and mid-sized companies. To learn more, contact your Partner, or call Dave Dorsey at 800-969-7900 x145. Or Contact Us – We are here to help.